Blond, beautiful bounty hunter Vega Brookes is on the hunt for her latest skip trace. 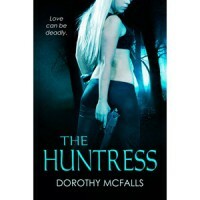 Her prey, ex-special forces officer Grayson Walker, is ruthless, a killer. She shouldn't feel attracted to him. Even so, the closer she gets to finding Grayson, the louder her instincts shout that things are not what they seem. Grayson Walker is dangerous...and determined. Someone is killing those closest to him, and he's desperate to find out why. When a firecracker of a bounty hunter comes close to capturing him, he fights back and ends up shooting her. Yet not even a gunshot wound can cool the sparks that fly between them whenever they're together. Soon, his life turns into a deadly race to earn Vega's trust, track down a killer, and avoid falling in love. I really liked it, even with the typos. Some people go on about it being predictable, but honestly sometimes that's ok, at least for me. It wasn't that predictable.